10% off. At the end of your order at sensorytherapyshop.com enter NEW10 as the coupon code. Lycra Bed Compression Sheets for Deep Pressure Input. 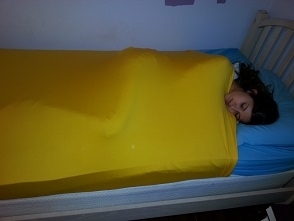 Lycra Bed Compression Sheet swill work wonders on children who have a difficult time unwindining, relaxing, and calming his/her body for sleep. 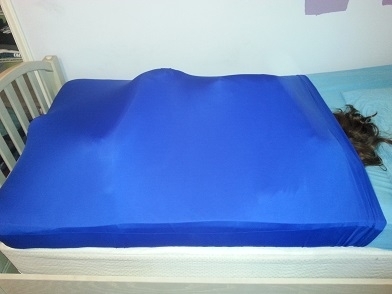 Lycra Compression bed sheets stretch over the body and gives deep pressure that will calm and soothe an over-aroused, disorganized, or "fearful" nervous system. Do you find yourself and your child covered with stuffed animals, pillows or layers of blanket/comforters on top of you, or enjoy sleeping in a mummy-type sleeping bag to drift off to and get a good night's sleep? With the lycra bed sheet you can leave this all behind. 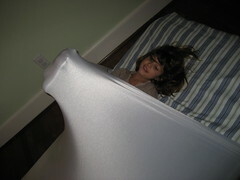 Children love to craw in the middle of the bed and push up against the lycra. Making a little fort for fun. Therapists can join in the fun and crawl in with the child to help with the calming. 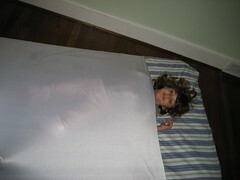 Older children or adults with SPD, we may still need to be tightly wrapped to calm over aroused nervous system down and the lycra bed sheet is perfect for that sensory stretchyz night sleep. Lycra bed sheets work better than weighted blankets. With bed sheets you will not get hot or wake up in the middle of the night from kicking off the blanket or stuffed animals. 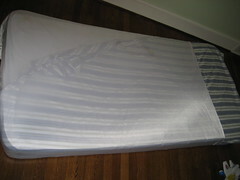 Many customers tell us how the bed sheet makes their lives alot easier. You can choose the size of the bed and the color of bed sheet from the variety of colors listed below.